Turbosmart Oil Pressure Regulator OPRT40, TS-0801-1002. 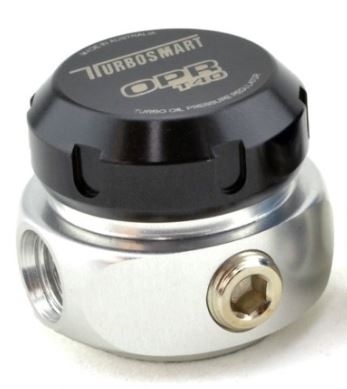 Turbosmart’s new OPRT40 is an oil pressure regulation system for your turbocharger. It helps prevent compressor or turbine stage oil leaking or smoking, and takes the guesswork out of oil restrictor sizing for more efficient and effective oil delivery. It restricts the maximum oil pressure to 40psi, without reducing the oil volume at lower pressure. This is an awesome innovative idea from Turbosmart! This regulator works a lot like a fuel pressure regulator, you do need an additional line to return oil back to the oil pan. The in/out/return fittings are AN-4 ORB (O-ring),and there is a 1/8" NPT port on the side for an oil pressure sensor. We can make a turbo oil line kit for you including this regulator and/or the new Turbosmart oil filter. Give us a call if you have questions at 909-753-7385 Mon-Fri 10am-6pm.